For the ice hockey player and coach, see John Gruden. Jon David Gruden (born August 17, 1963) is an American football coach who is the head coach of the Oakland Raiders of the National Football League (NFL). He first served as the Raiders' head coach from 1998 to 2001 and rejoined the team in 2018. In between his tenure with the Raiders, he was the head coach of the Tampa Bay Buccaneers from 2002 to 2008, with whom he led to the franchise's first Super Bowl title in XXXVII. At the time, Gruden, aged 39 years, 5 months and 9 days, was the youngest head coach to win a Super Bowl. Gruden also served as an analyst for ESPN and Monday Night Football before he returned to coaching. Gruden was born on August 17, 1963, in Sandusky, Ohio. His father, Jim, later served as a professional football regional scout, running backs coach, and director of player personnel for the Tampa Bay Buccaneers. His brother, Jay, played and coached in the Arena Football League, and is now the head coach of the Washington Redskins. His other brother, James, is a radiologist at Weill Cornell Medicine. Gruden was raised Christian, and was a Cleveland Browns fan growing up. At the age of 15, he attended Clay High School in South Bend, Indiana, home to the University of Notre Dame, where his father served as an assistant to head coach Dan Devine. After graduating in 1981, Gruden attended Muskingum College in New Concord, Ohio. After one year, he transferred to the University of Dayton, where he was a three-year letterman and backup quarterback for the Flyers  under coach Mike Kelly. Gruden never saw much playing time, but the Flyers posted a 24–7 record during his three seasons at the University of Dayton. He graduated with a degree in communications in 1986. After graduating from the University of Dayton, Gruden was hired as a graduate assistant coach at the University of Tennessee during the 1985–1986 season. After his time with the Volunteers, he spent two years after that as the quarterbacks coach at Southeast Missouri State. Gruden then moved to the University of the Pacific in 1989 as offensive assistant as the tight ends coach. Walt Harris was the offensive coordinator at Tennessee, where Gruden was one of his graduate assistant coaches, and later hired him at Pacific. In 1990, Gruden was a special assistant with the San Francisco 49ers under quarterbacks coach Mike Holmgren. In March 1991, Gruden became the wide receivers coach for the University of Pittsburgh under head coach Paul Hackett. In January 1992, at the age of 28, Gruden was hired by Mike Holmgren, his former boss at the San Francisco 49ers, to be the special offensive assistant/wide receivers coach with the Green Bay Packers. After three seasons in Green Bay, Gruden became the offensive coordinator of the Philadelphia Eagles under former Packers assistant coach Ray Rhodes. Gruden then was chosen by the owner and general manager of the Oakland Raiders, Al Davis, to be the Raiders' new head coach for the 1998 season. Over Gruden, the Raiders posted consecutive 8–8 seasons in 1998 and 1999, and leapt out of last place in the AFC West. After uniting with journeyman quarterback Rich Gannon, Gruden led the Raiders to the top of the AFC West and they made the playoffs in three consecutive seasons from 2000 to 2002 (the third season was under head coach Bill Callahan). Oakland finished 12–4 in the 2000 season, the team's most successful season in a decade, and its first division title since 1990, ultimately reaching the AFC Championship, where they lost, 16–3, to the eventual Super Bowl champions Baltimore Ravens. In 2001, the Raiders would return to the postseason with a 10–6 record, but in the AFC Divisional Round a negated fumble proved costly as they were defeated, 16–13, in overtime by the eventual Super Bowl champions New England Patriots. While Gruden was with the Raiders, Gruden acquired his nickname "Chucky" from Raiders defensive lineman Grady Jackson, who thought that the coach looked like the fictional character "Chucky" in the 1988 slasher movie Child's Play. Gruden visited U.S. troops in Iraq during a USO tour in July 2009, where he allowed a serviceman to wear his Super Bowl ring. After compiling a 40–28 win-loss record (including playoffs) in four seasons with the Raiders, Gruden replaced the fired Tony Dungy as head coach of the Tampa Bay Buccaneers in 2002, via a high-stakes trade that included Tampa Bay's 2002 and 2003 first-round draft picks, 2002 and 2004 second-round draft picks, and $8 million in cash. The trade took place for a number of reasons, including Davis's desire for a more vertical passing attack rather than Gruden's horizontal pass attack, the fact that Gruden's contract would expire a year after the trade, and Davis's uncertainty over whether Gruden was worth as much money as his next contract was sure to pay him. Gruden signed a five-year contract with the Buccaneers worth $17.5 million. The Buccaneers' search for a head coach had taken more than two months, and Tampa Bay had expressed an interest in Gruden, but Davis had originally refused to release him from his contract. The team subsequently interviewed several other coaches and believed a deal was in place with Bill Parcells, before Parcells backed out, reportedly because his choice for General Manager, Mike Tannenbaum, told him not to accept the job because of the salary cap difficulties that Tampa Bay was about to endure. With the franchise's search floundering, the fact that the coach who the Buccaneers wanted had only one year remaining on his deal, and the immediate hire of Dungy by the Indianapolis Colts, many fans and sports commentators began to openly question if the Buccaneers had made the right move by dismissing Dungy. Only a big splash hire could quiet the storm, and this may have been the primary motivation for the Buccaneers to give up as much as they did to acquire Gruden. Immediately after arriving in Tampa Bay, Gruden significantly retooled the offense with the addition of numerous free agents. His determination to fix the under-performing offense, so often maligned during Dungy's tenure, inspired Tampa's defense to another #1 ranking, which helped the team to a 12–4 season. Both the offense and defense hit their stride in the playoffs; the Buccaneers posted a playoff per-game point differential of 23 points per game in victory, tied with the 1992 Dallas Cowboys for the highest average playoff margin of victory by a Super Bowl winner in the free agency era. Fans were especially satisfied with a victory in the NFC Championship game against the Philadelphia Eagles, the team that had defeated Tampa Bay in the Wild Card round two years running by the combined score of 52–12, and Gruden was especially satisfied with a dominant win over his old team, the Raiders, in Super Bowl XXXVII. Despite the Super Bowl win, there were many who attributed Gruden's win primarily to the defense that coach Tony Dungy and defensive coordinator Monte Kiffin had created during Dungy's tenure with the Buccaneers. Gruden, for his part, publicly and graciously thanked Dungy for his contributions upon accepting the Lombardi Trophy at the Super Bowl XXXVII postgame ceremony. Gruden's mantra for the 2002 season was "Pound the Rock", a reference to commitment to the running game. Gruden even went as far as to display a large chunk of granite in the locker room, a tactic mimicked by the Jacksonville Jaguars. (The Jaguars' slogan, "Keep choppin' wood", was tainted though when punter Chris Hanson injured his leg on an axe brought in to accompany a large log.) Upon returning to Tampa after winning Super Bowl XXXVII, he led a capacity crowd at Raymond James Stadium in chanting the phrase. However, it seemingly disappeared from the lexicon the following year, and was not aggressively marketed or displayed on stadium video boards. Unable to afford replacements, the team was decimated by injuries to many of the Super Bowl stars, including Joe Jurevicius, Greg Spires, Shelton Quarles, and Brian Kelly, as well as acrimony with highly paid veterans such as Sapp and wide receivers Keyshawn Johnson and Keenan McCardell. When former Raiders general manager Bruce Allen joined the Buccaneers in 2004, Gruden finally had the general manager–head coach partnership he desired, and while the salary cap continued to plague the team (which spent the least money in the league between 2004 and 2009) their 2004 and 2005 drafts yielded a few impact players, including 2005 Offensive NFL Rookie of the Year Award winner Carnell "Cadillac" Williams. Also, 2005 marked a return to the playoffs, as the Buccaneers posted a surprising 11–5 record, despite the loss of starting quarterback Brian Griese and some controversial coaching decisions, including a two-point conversion in the final seconds to defeat the Washington Redskins, who would later return to Tampa Bay and eliminate the Buccaneers from the wild-card round of the playoffs. In 2006, Gruden led the Buccaneers to a dismal 4–12 season, which was his worst record as a head coach. The 2006 season was the first time a Tampa Bay team had not won more than four games since 1991. In an interview with Ira Kaufman of The Tampa Tribune on March 28, 2007, Buccaneers executive vice president Joel Glazer discussed the state of the Buccaneers. During the interview, Joel Glazer defended Gruden's performance, citing lost draft picks, injuries, and salary cap issues. However, he also said "Mediocrity will never be standard for the Buccaneers, but we have to move on." In 2007, the team finally cleared itself of salary cap constraints and united Gruden with a mobile West Coast quarterback in former Pro Bowler and Grey Cup winner Jeff Garcia. The Buccaneers returned to the playoffs in 2007 with a 9–7 record, including five divisional wins (after resting starters for the final two games). This despite suffering major injuries, several season-ending, to critical players like Luke Petitgout, Carnell Williams, Mike Alstott, Alex Smith, Brian Kelly, Barrett Ruud, Michael Clayton, Patrick Chukwurah, Gaines Adams, and starting kick and punt returner Mark Jones. Despite this adversity, however, Gruden declared "The future is so bright around here I have to wear shades". In 2008, Gruden was rewarded with a contract extension through the 2011 season. On November 30, Gruden earned his 100th career victory, which came against the New Orleans Saints. Going into December, the Buccaneers were on pace to make the playoffs, claim a bye week and have home field advantage. However, the Buccaneers went winless in the month of December, in no small part due to a defensive collapse that saw the team give up an average of 30.75 points per game. On December 28, the Buccaneers were eliminated from making the playoffs by the Oakland Raiders, the team Gruden left for Tampa Bay. The Buccaneers ended the season with four losses in a row, and Gruden was fired by the Buccaneers on January 16, 2009, after seven seasons with the team. In May 2010, Gruden became a volunteer assistant offensive line coach at Carrollwood Day School in Tampa, Florida. Shortly after being fired from Tampa Bay, Gruden created the Fired Football Coaches Association. The organization (a "football think-tank") had its headquarters in a rented office in a Tampa strip mall. The FFCA was known to have a large amount of game and player film collected by Gruden as well as playbooks and Gruden was known to have game plans of his own that he kept updated over the years he was not actively coaching. Many coaches such as Chip Kelly, Urban Meyer, Jim Haslett, Rick Venturi, Sean McVay, Greg Schiano and Monte Kiffin and many players came to the facility to watch film and talk with Gruden. Gruden closed the FFCA upon his returning to coaching in 2018 moving the game and player film along with the other information he held there to Oakland. 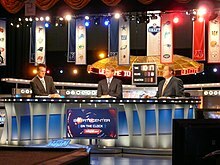 In May 2009, Gruden was hired by ESPN to serve as a color analyst on its Monday Night Football telecasts, replacing Tony Kornheiser. He also served as an analyst for ESPN's coverage of the NFL Draft and postseason college football games, helping to call the 2010 Rose Bowl and 2010 BCS National Championship Game on ESPN Radio and the 2011 Outback Bowl and 2011 Orange Bowl on ESPN. In the spring of 2012, became the focus of the series Jon Gruden's QB Camp, where Gruden went over the NFL development process with prospective NFL Draftees at quarterback, including Andrew Luck and Robert Griffin III in which he occasionally has talks about what he believes to be the best play in football (a play-action pass called "Spider 2 Y-Banana", in which the fullback runs a flat route and is the primary target). During the Monday Night Football broadcast, Gruden gave out a weekly award called the "Gruden Grinder" to the best player in the game that week. He signed a contract extension with ESPN, beginning in September 2012, that lengthened his tenure with the broadcasting company for another five years. On December 15, 2014, Gruden and ESPN agreed to a contract extension through 2021 but allowed an out in the event he wanted to return to coaching. The deal made Gruden the highest paid personality at ESPN. After deciding to return to the coaching ranks with the Raiders for the 2018 NFL season, his last game for ESPN was the 2017 AFC Wild Card game between the Tennessee Titans and the Kansas City Chiefs. After nine years away from coaching in the NFL, the Raiders announced the return of Gruden as head coach on January 6, 2018. Gruden signed a 10-year, $100 million contract, one of the biggest contracts in the history of the league which also includes a no-trade clause, closing the loophole that saw the Raiders trade him to the Buccaneers in return for draft picks and cash. Gruden came back to coaching after six years of attempts by Raiders owner Mark Davis to lure him back to be the Raiders head coach. Gruden said that he came back due to his need to go compete "I got tired of sitting in a dark room, watching tape by myself," Gruden says. "I took rumba-dancing classes; that didn’t last—I wasn’t any good. Bought a boat; I never used it. Live on a golf course; I never play. I’d go to the FFCA early, and next thing I know it’s 10:30 at night. I’m thinking, S---. I’m wasting my time. I got to go compete.". Some of his first few moves included signing several older, declining veterans past their prime, drafting Kolton Miller in the first round of the 2018 draft and trading away Khalil Mack for 2019 and 2020 first round draft picks, and later trading Amari Cooper for the Dallas Cowboys' first round draft pick. The team would go 4–12 in his first year back with the team. ^ a b c Rick Stroud (January 12, 2003). "We're just getting started here". St Petersburg Times. Retrieved October 26, 2012. ^ "Washington Redskins: Jay Gruden". Washington Redskins. Retrieved July 30, 2017. ^ "James F. Gruden, M.D." Weill Cornell Medicine, Patient Care. Retrieved October 15, 2017. ^ "Gruden at coaching clinic". The Knoxville News-Sentinel. March 29, 2012. Retrieved October 26, 2012. ^ Scott Newman (December 1, 1991). "Turmoil, Poor Decisions Dimmed Pitt's Early Promise". Pittsburgh Post-Gazette. p. D10. Retrieved October 26, 2012. ^ a b Scott Newman (January 23, 1992). "Packers Get Pitt Coaches". Pittsburgh Post-Gazette. p. C1. ^ "Baseball Atlanta Braves -- Agreed to terms with OF Tommy..." Baltimore Sun. March 7, 1991. p. 4C. Retrieved October 26, 2012. ^ "Franchise Snapshot: Oakland Raiders". Football Digest. 30 (9): 12. June 1, 2001. ^ "'Chuckie' agrees to deal with ESPN". Hamilton Spectator. October 18, 2011. p. S2. ^ "Moneyball, NFL style". June 26, 2009. ^ "Mediocrity Will Not Be Accepted Around Here". The Tampa Tribune. Archived from the original on April 3, 2007. Retrieved April 4, 2007. ^ Attner, Paul (2004). "Separation of Powers Key to Long-Term Growth". The Sporting News. Archived from the original on July 8, 2012. Retrieved October 4, 2007. ^ "Bucs Fire Jon Gruden, Bruce Allen". The Tampa Tribune. January 16, 2009. Archived from the original on February 3, 2013. Retrieved January 16, 2009. ^ Stevens, Mitch (May 6, 2010). "Jon Gruden to coach high school football at Carrollwood Day". MaxPreps. ^ "FFCA – Giving Back to The Game We All Love: Football". FFCA. Retrieved July 30, 2017. ^ Sanneh, K. (2011). MONDAY NIGHT LIGHTS. New Yorker, 87(40), 40-45. ^ Pompei, Dan. "Inside Jon Gruden's 'Maniacal' Obsession with Football". Bleacher Report. Retrieved February 26, 2018. ^ "Exclusive Q&A with Raiders' Jon Gruden: His first 30 days in office". The Mercury News. February 14, 2018. Retrieved February 26, 2018. ^ "Jon Gruden replacing Tony Kornheiser on Monday Night Football". SI.com. May 18, 2009. ^ "Jon Gruden staying with ESPN". ESPN.Com. ESPN. Retrieved December 30, 2011. ^ "Jon Gruden gets ESPN extension". ESPN. Retrieved January 6, 2016. ^ "Jon Gruden revealed as the highest paid ESPN personality". Awful Announcing. September 29, 2015. Retrieved January 27, 2018. ^ "Raiders officially name Gruden new head coach". ESPN.com. Retrieved January 7, 2018. ^ "Raiders owner on Jon Gruden hire: It's 'a big f-ing deal'". NFL.com. Retrieved January 10, 2018. ^ "Solving the mystery of why Jon Gruden returned to coaching". USA TODAY. Retrieved February 26, 2018. ^ "Jon Gruden in Oakland: Ready to Grind". SI.com. Retrieved February 26, 2018. Wikimedia Commons has media related to Jon Gruden.